Take a stand. Donate to charities that reflect your values. This is for you. We believe in a global community that cares for each other. It begins with a commitment to what you care about. Backed by evidence and supported by experts. Donational is run at-cost by a team of dedicated members building useful tools for the greater good. 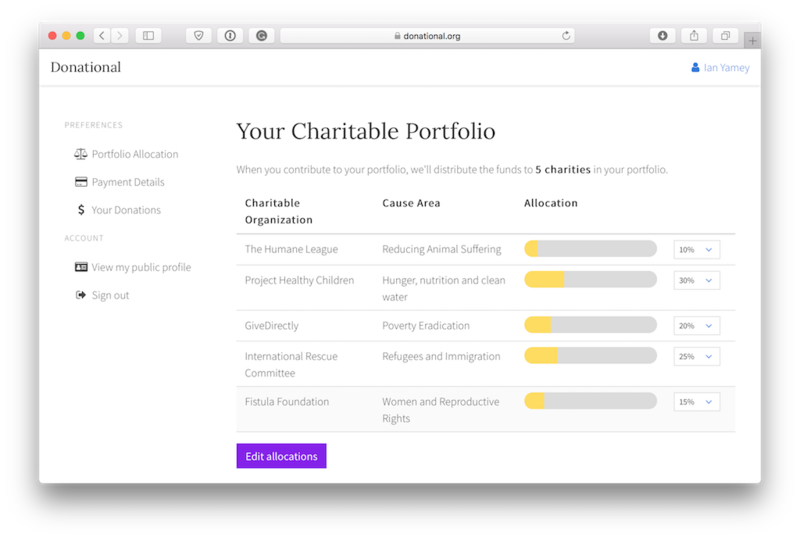 Donations are directly distributed to charities and make use of smart features like donation pooling to ensure that charities spend more on making an impact, and less on processing donations. Standard credit card payment processing fees apply. We only make money if you choose to pay us, allowing us to continue to help you — and others — make a greater impact. Give $1 or $1000, we can make a real impact together. The amount that I donated used to depend on how I was feeling the day when I was asked. Donational gave me tools to help me understand how much I can give. It's so easy to track! I'd often try to research top charities for issues I cared about, only to get lost in all the details. Now, it's like having a personal advisor to guide me through a shortlist of highly effective charities. I don't need to remember to mail in a bunch of checks or separately itemize handfuls of donations at tax time. I get peace of mind knowing that my money is getting to where it is needed.